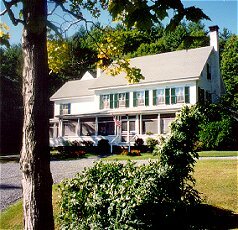 The Inn On Golden Pond is an impressive country home built in 1879, located near Squam Lake, setting for the classic film "On Golden Pond." It is surrounded by 50 wooded acres with walking trails crisscrossing the property. The area offers a variety of outdoor activities year round. For those who prefer less rigorous pastimes there are numerous superior restaurants and plenty of good shopping opportunities nearby. The Bed and Breakfast is known for its refreshingly friendly yet professional atmosphere. Furnished to provide maximum comfort, seven spacious guestrooms and one suite are decorated in traditional country style. All have private baths. Breakfast is a time of distinction at the Inn featuring homebaked breads and muffins, homemade jams and a variety of delicious house specialties. This and other Holderness Bed and Breakfast Inns can be found here in The Register.